I don't know much about this cultivar or if its actuality from Hawaii. 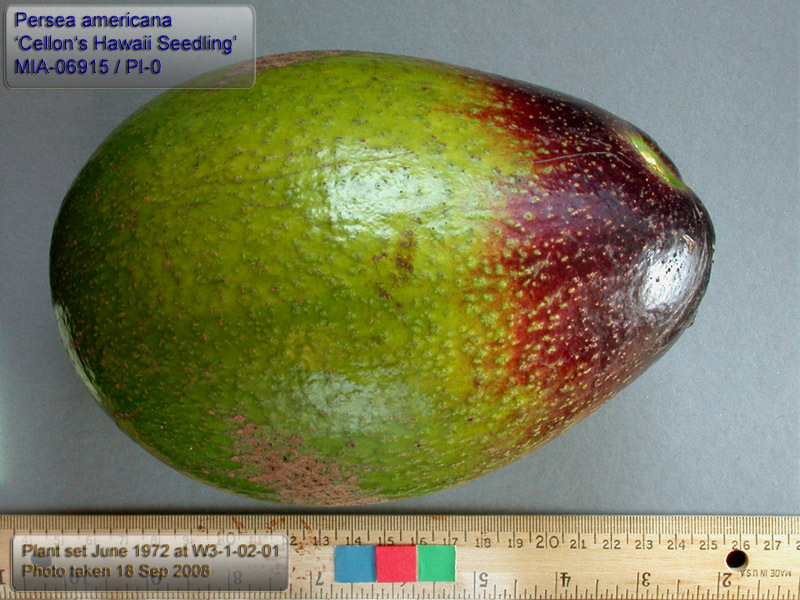 I saw reference to this is a USDA paper and it made reference to it indicating it was an early flowering B type. It was collected by the USDA in 1933. I did see some fruit on the tree and seems to turn redish when mature. Reported to be a 23 oz fruit. with a small seed in the 2.3 oz. That is small. I'll like to see it. My interest is as a pollinator for early A flower varieties. I have it sharing space with another variety with similar characteristics, the Vero Beach. Both growing on the same tree. I would probably keep this for a couple of years pending evaluation of its flowering habits. I have top worked both trees in December 2013 and are growing nicely. May 30, 2015: This tree as well as the Vero Beach are growing very well. the Cellon only set one fruit that I can see. It is 4-5 oz so far. May be we get to see the small seed.